Twitter is one of the most used social networks with millions of users worldwide and for a blogs popularity social media plays an important role. It is important to provide social subscription options to your visitors so that they can subscribe to your blog and get updated every time there is a new post. Social media also helps increase a blogs traffic, The more a post has been shared the more likely it'll receive recurring traffic from social media users. The Widget used for Subscription on your blog must be attractive, So that it can bring users attention and get more subscribers. Today we are talking about Twitter, here is an attractive as well as cute twitter widget for your blog which will surly bring lots of followers. Click on this button to see working demo of the widget. 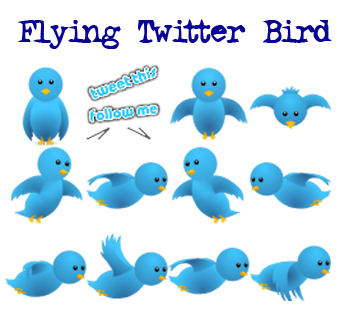 This widget makes a cute bird fly on your webpage and follows you as you scroll up and down. This widget has been created by way2blogging. Step 1: From your Blogger Dashboard, Go to Layout. Step 4: Copy and paste the following code into the window. Step 5: Now make the following changes before saving. Step 6: Now Save Widget. Hope you guys like this widget, All thanks to Way2Blogging. Please leave your comments below.